I’ve come to really look forward to the opening night of the London Art Fair. It’s the first big art-world event after Christmas, and by now the novelty of over-indulgence has certainly worn off. But here at the fair, surrounded by gilded frames, champagne, bow ties and stilettos, it feels good to be back in the swing of things. Upon arrival at the Business Design Centre, I make a beeline upstairs to Photo50 and Art Projects, home to the funkier contemporary galleries. It’s become something of a tradition to make the Catlin Guide stand the evening’s first stop and pick up a copy, which is cerulean-blue this year and hot off the press. 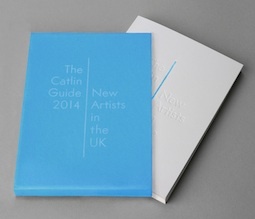 Now in its fifth year, the Catlin Guide (curated by Justin Hammond) has built up a sterling reputation as a showcase for the best new graduates across the country. There’s an exhibition of works by some of the selected artists, but all eyes are on the guide itself. With artists such as Dennis J. Reinmüller and Mr. & Mrs. Philip Cath featured in its pages, the Catlin Guide is a LAF hot ticket. Around the corner, Axisweb – an online showcase for contemporary artists – has put together a lovely little stand. A pair of chess paintings by Tom Hackney, in which he sequences chess moves from games played by Duchamp in alternating layers of black and white gesso, are smartly striking. I recognise them from BREESE LITTLE’s ‘Plural’ show at WW Gallery last year, where they were equally compelling. Also at Axisweb is a series of collage and watercolour works on card by Clive A. Brandon. There’s an overabundance of archival/collage art at the moment, but Brandon’s stands out for its balance of rough and ready with precise geometry, greyscale with Technicolor, and collage work with original watercolour. They look so good as a grouped composition, it’s almost a shame to sell them as separate works. A splash of yellow caught my eye on dalla Rosa’s stand. The colour was provided by a nicely curated selection of images by painter Benjamin Bridges. 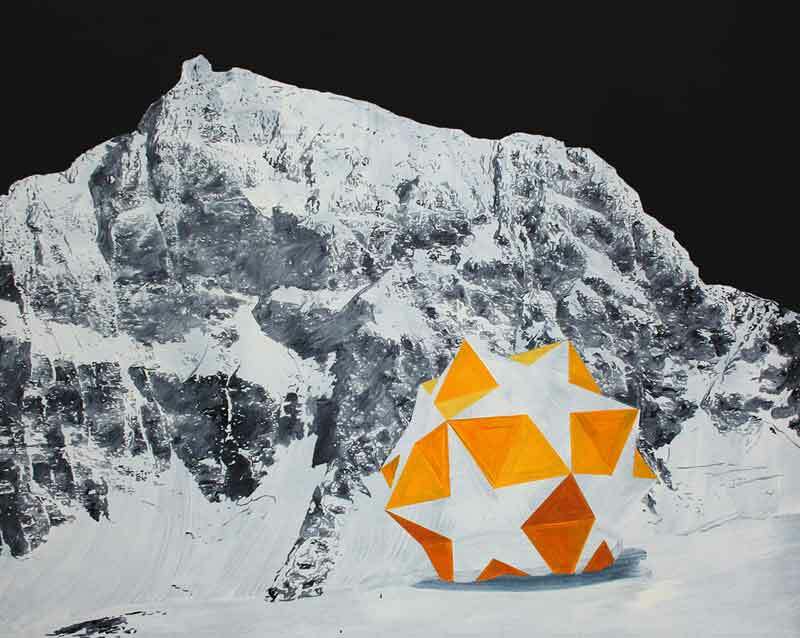 Antarctagon, in particular – a surreal geometric object in a rather sublime landscape – put me in mind of a cross between Alex Hartley and Alex Ball. On the same stand, I’m surprised at how much I gravitate towards Kasper Pincis’ pieces of typewritten text on newsprint. The endless repetition of text makes hypnotising patterns that combine with the folds of the newsprint to create a kind of abstracted landscape. Across the hall, I was particularly taken with the many works of Caroline Corbasson shown by Parisian gallery L’Inlassable on their first outing to the London Art Fair. Corbasson’s work purports to question the ‘shortcomings of our scientific knowledge’, which is something I can certainly get on board with. Again, the presence of archival works – blacked-out text on antiquarian books – nearly caused me to turn my head, but her other pieces held my interest. 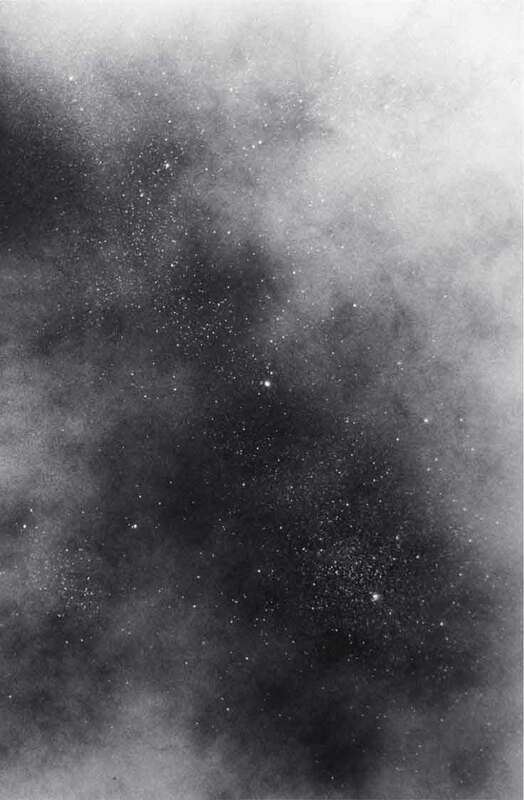 Eclipse, a globe covered in graphite, and Dust to Dust, dust and black spray-paint on paper, were objects of true beauty, but packed a conceptual punch, too, highlighting how little we know about ourselves, our planet, and indeed our universe. Finally, at The Residence Gallery, The Firing Squad by Canadian artist Tasman Richardson caught my eye. From a quick peek on the artist’s website, the live incarnation of the work looks incredible, like a pared-down Ryoji Ikeda, but the video piece shown here was suitably compelling. The artist filmed old-fashioned tube television sets turning on and off, which emit a fuzzy popping sound, and then edited the footage into an abstract film with a deliciously minimal rhythmic soundtrack. It made me feel like dancing, and that’s rarely the feeling I have on leaving an art fair. It’s good to be back.